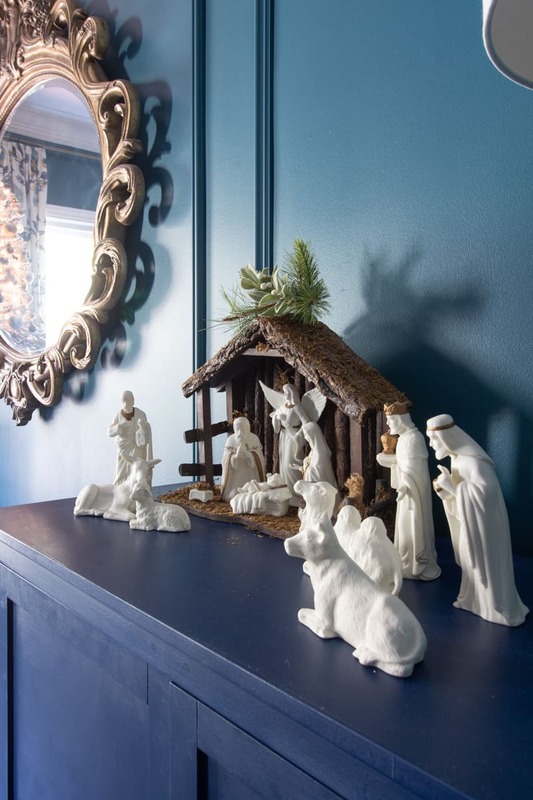 Welcome to my first Christmas Home tour this year. 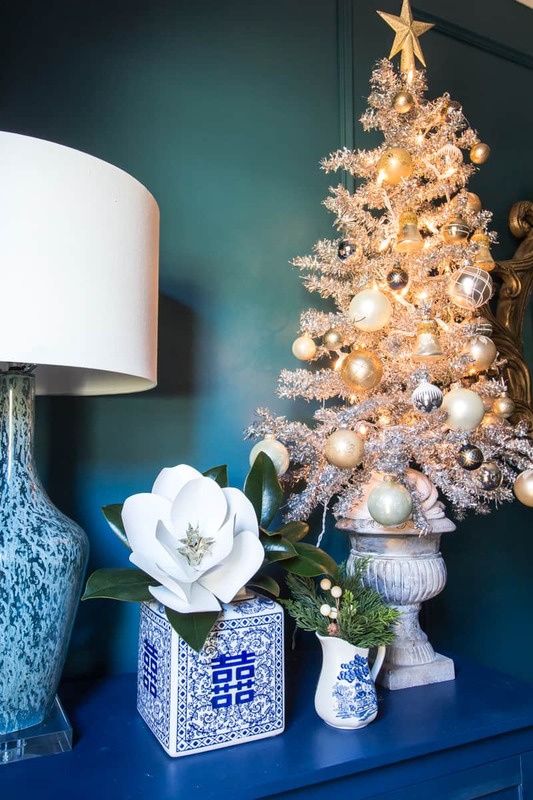 I didn’t set out to have a theme, but it definitely ended up with the recurring elements of Silver Bells and Magnolias. 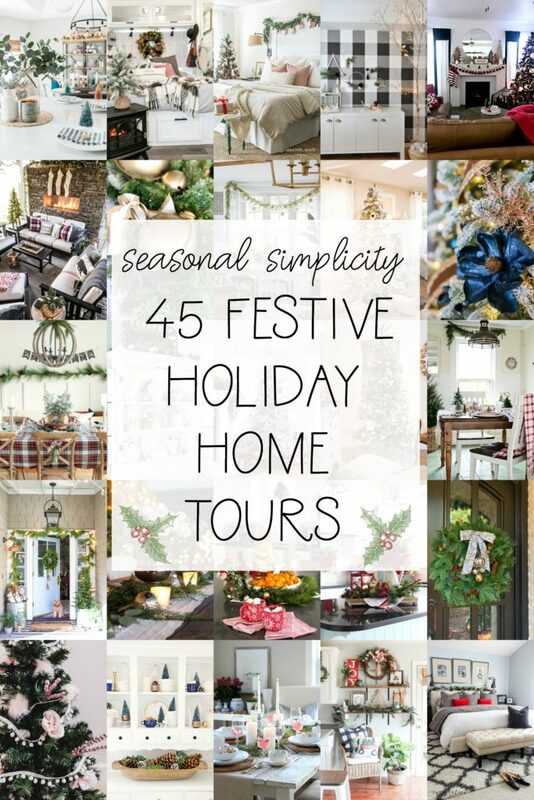 If you are coming from the lovely Amber Tysl today as part of the Seasonal Simplicity Christmas Series Home Tours, welcome! I’m Leslie! 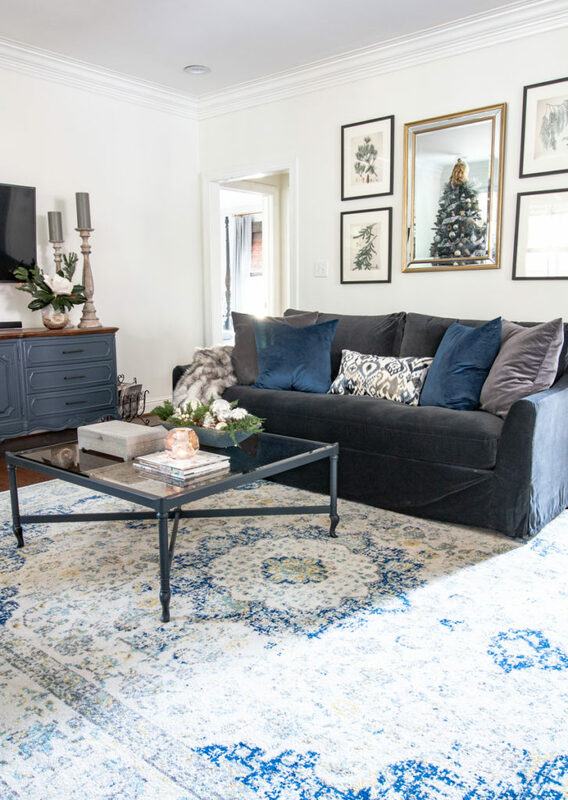 I’m passionate about sharing the renovation journey of our 90’s fixer upper in Alabama. 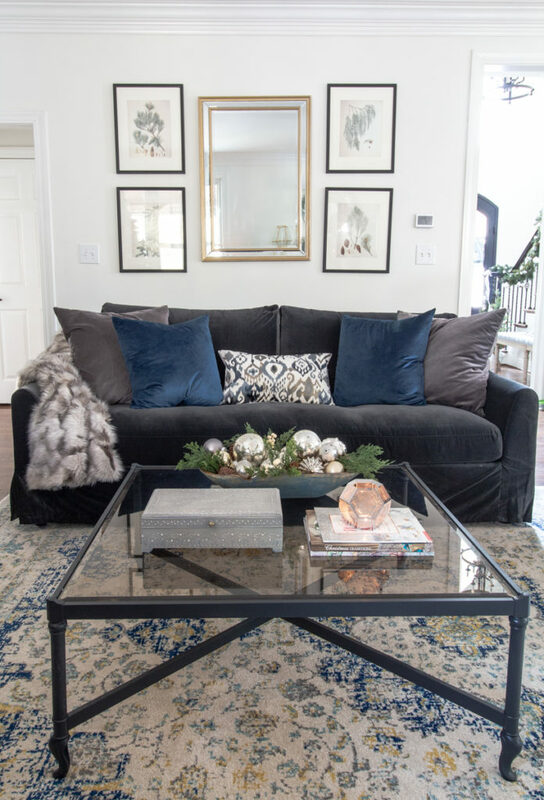 The house had been in foreclosure and needed a full renovation and lots and lots of love. 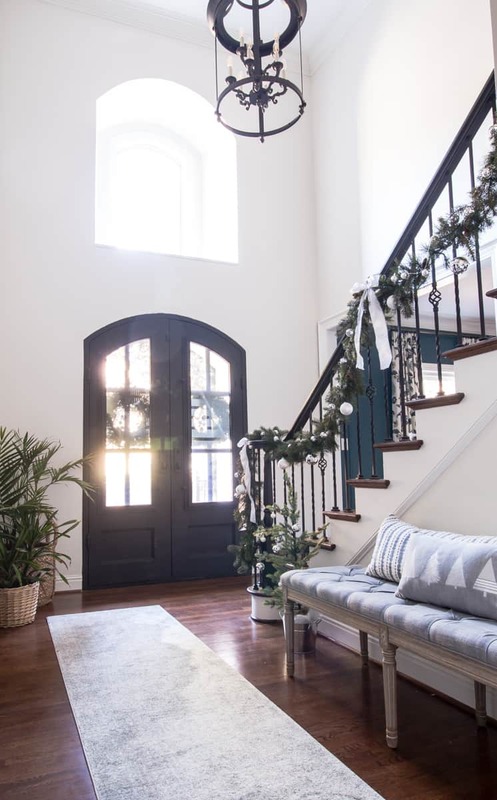 We have been working tirelessly to update or remove dated architecture for 2 years to create a home that suits my southern traditional style. 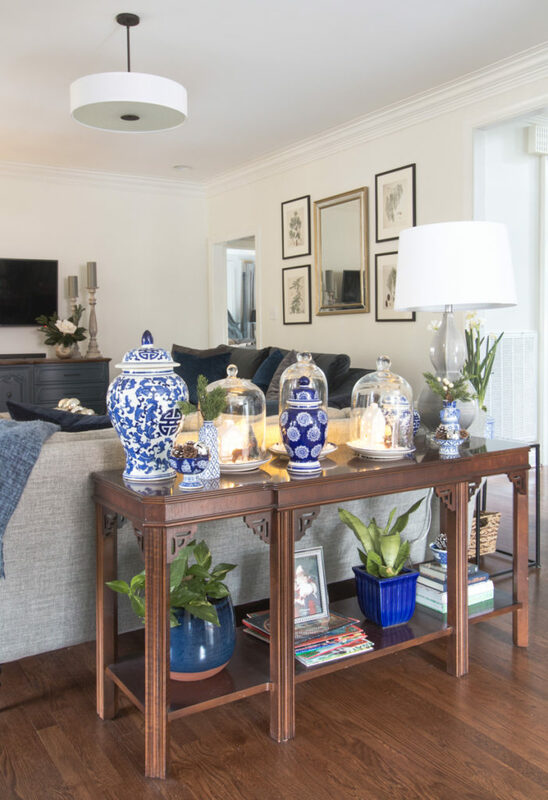 My hope is that with each project and room makeover you will be inspired to create a home you love on a budget. After a few years with at least hints of red, this Christmas, I wanted to return to a more muted palette. 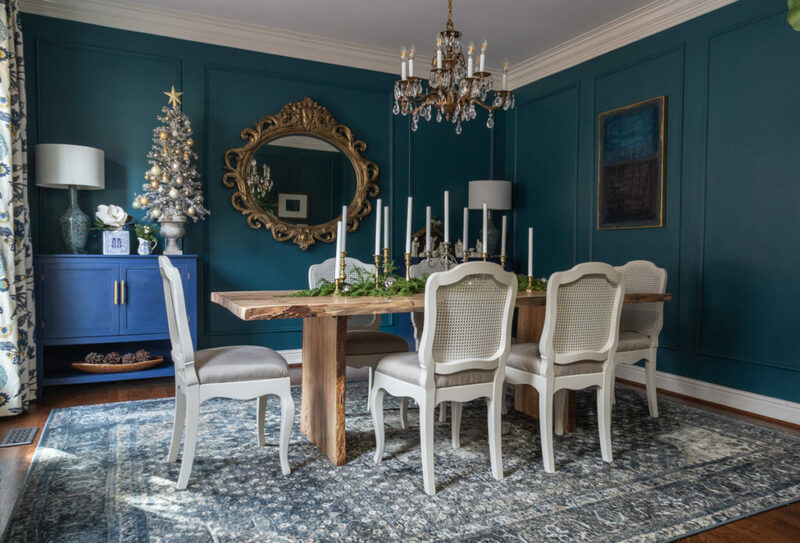 You can see last year’s Colorful Christmas Home Tour here. It is still one of my favorites. At the entry, I reworked the massive garland from last year, removing the red poinsettias and adding oversized silver ornaments. I’m lucky enough to have three large magnolia trees in the front yard so adding the deep green shiny leaves here and there is a free way to decorate for Christmas! I built the Christmas tree planters last year. Linked here. They are large enough to hold an artificial tree as well, but because my porch is not covered I opted for a pair of live cypress trees that I will plant in the backyard this spring. I added lighted silver bell garland this year along with a few ornaments. 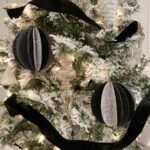 The silver and white ribbon was used on my tree last year! I like to challenge myself to reuse what I stored away in a new and fresh way. Of course, the show stopper in the foyer is this stunning live wreath from Lynch Creek Farm! At the end of this post be sure to enter to win your very own!! It smells so amazing! 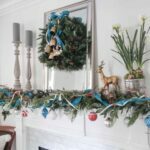 I love adding real wreaths and garlands whenever possible to bring in that Christmas tree smell without caring for a live tree. 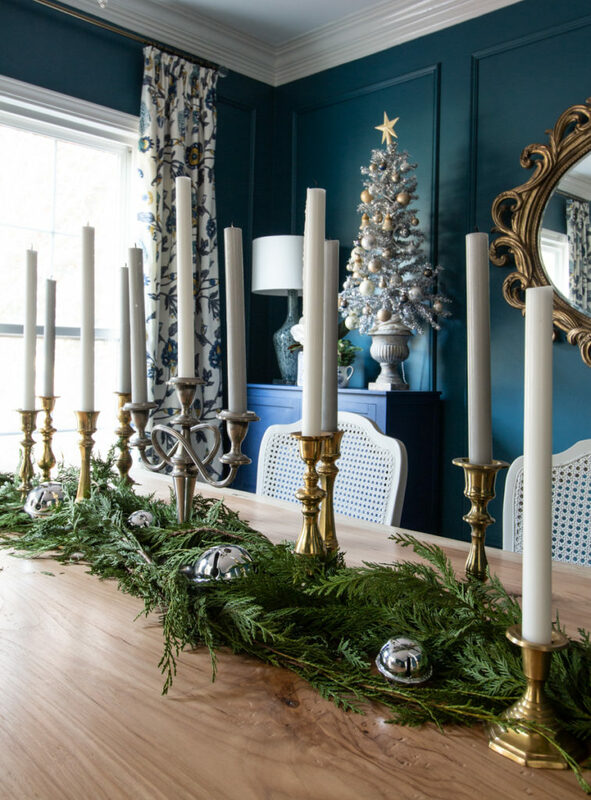 This garland, used as a simple runner on the table is also from Lynch Creek Farm. It is the Deluxe Port Orford Garland. 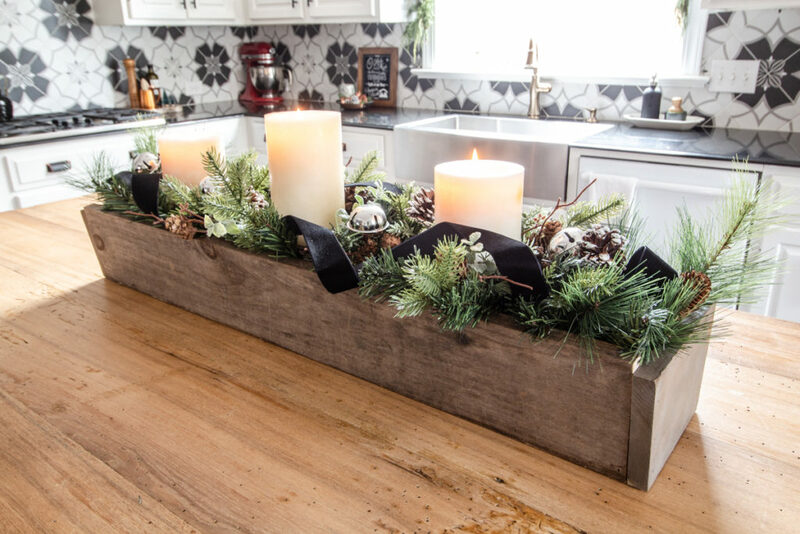 Check back on Friday for Part 2 of my Home Tour to see how I used the garland in the kitchen! Every year, I bring out my tacky Wal-Mart Christmas tree and it’s always on of my favorite things. Of course, vintage inspired trees like this are making a comeback but I’ve been using my “slightly psychedelic tree” before they were cool. I’m kind of a rebel that way. Beyond the magnolia leaves used here and there around the house, I finally created paper magnolias for my tree in the living room. I dreamed up this idea several years ago and this was the year I was determined to make them come to life. My mom gave me this beautiful nativity set many years ago and I love it! The matte white ceramic is incredibly detailed and the look is is timeless. 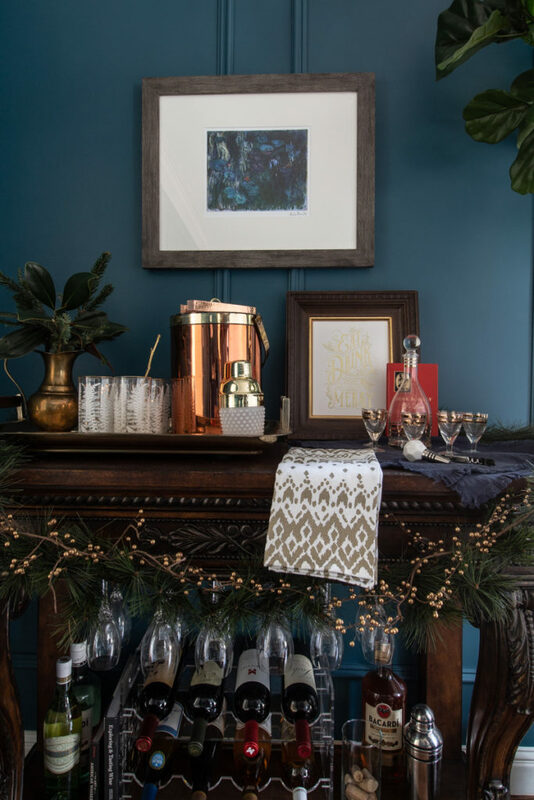 The bar I converted console table is styled cheerfully for the season too. 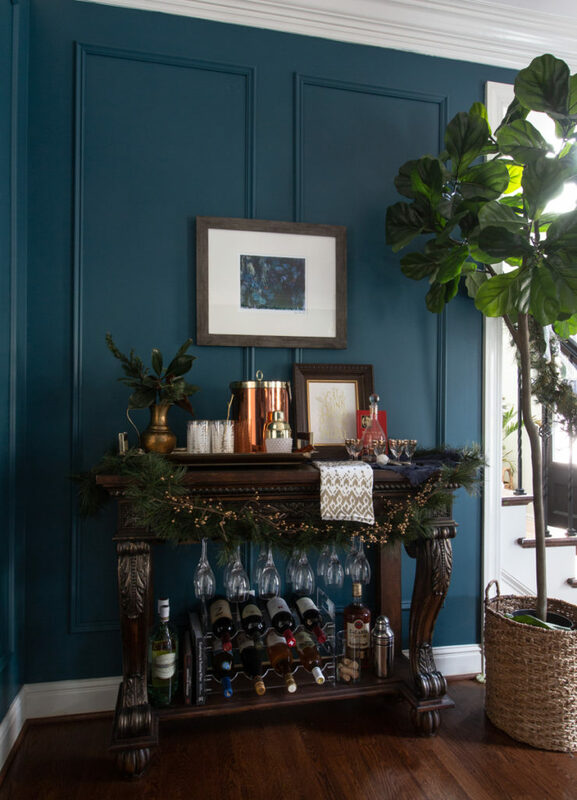 If you’ve been following me for a while then you’ve seen the mantle scape I created in the living room. You might notice, I added the silver bell garland here too. 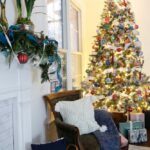 I created glittered snow globe lanterns this year. You can find that tutorial here. 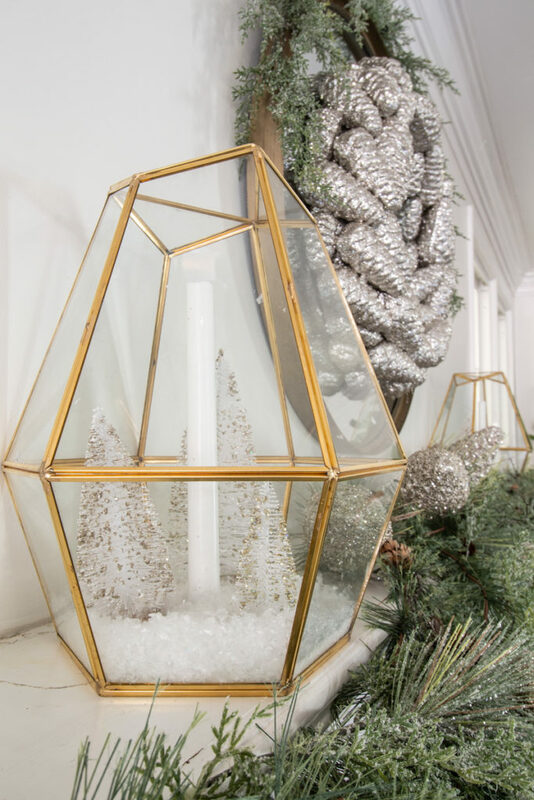 Inspired by the lanterns, I used my collection of cloches to create snow globes with little houses and bottle brush trees. 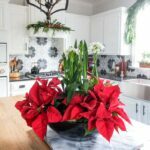 I updated the seasonal botanicals with printable from Blesser House. If you don’t follow her, you definitely should. You can find them here. Now here’s where a need to make a confession. I am not completely satisfied with the way my tree is right now. I had every intention of making more than just small tweaks to the tree once I made and added the paper magnolias. I’ll be posting a full tutorial very soon. I wanted to re-work the ribbons and add a darker grey ribbon too. But I ran out of daylight yesterday and didn’t have time to do anything more than tucking a few of them into the tree randomly. Follow me on Instagram and you won’t miss the update! 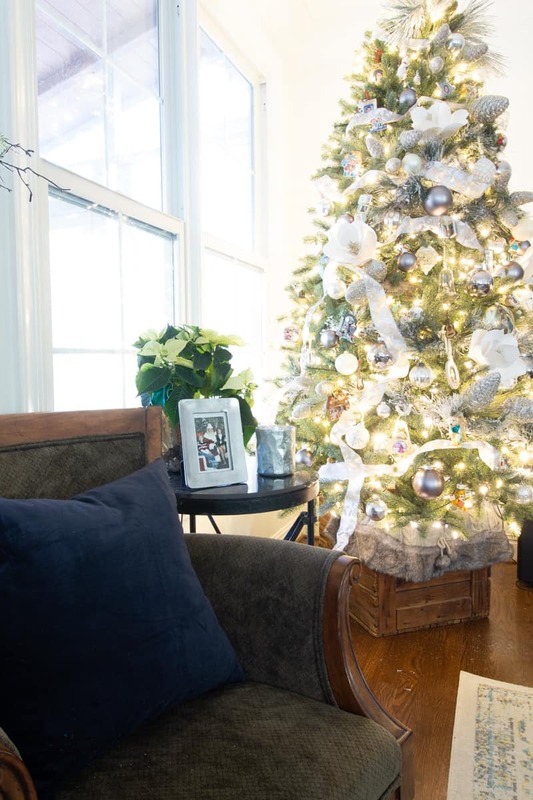 Don’t miss Part 2 of my Christmas home tour HERE. The next stop is the lovely Tauni Evertt! 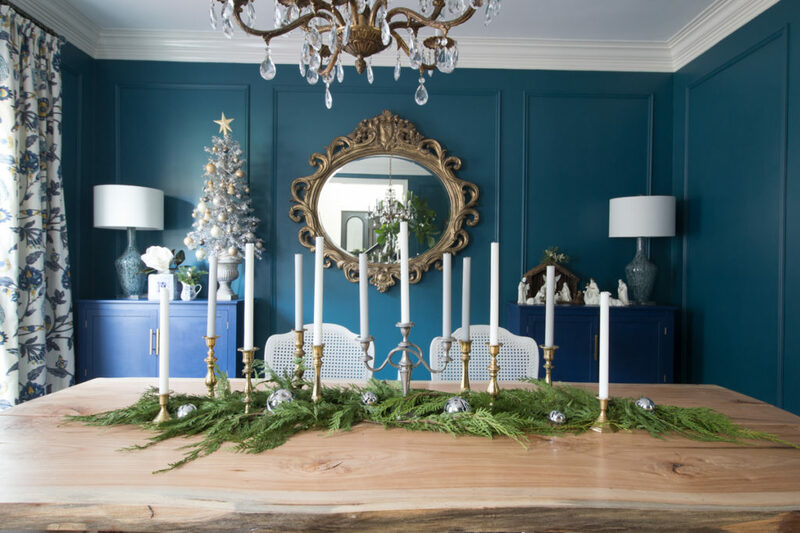 Don’t miss her stunning classic Christmas Style! « Pumpkin Cloud Cookies the perfect Thanksgiving treat. Leslie, your home is gorgeous! 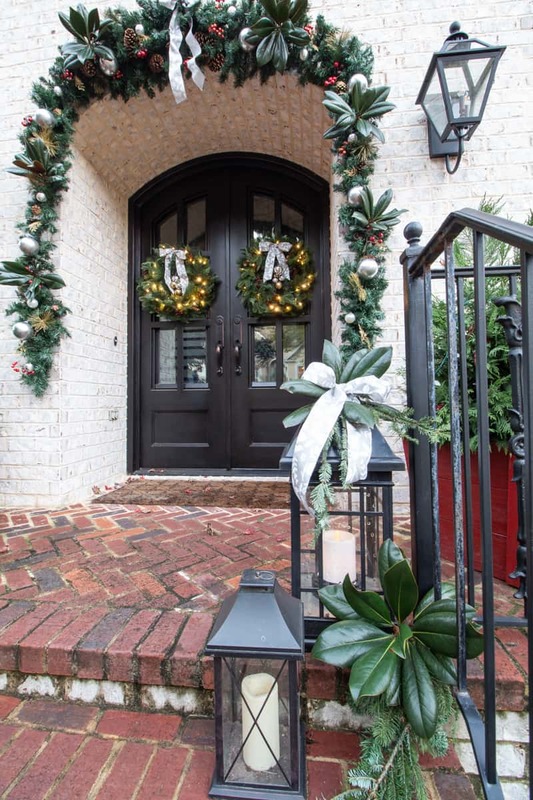 Your front door way is amazing with all the greenery and magnolia. 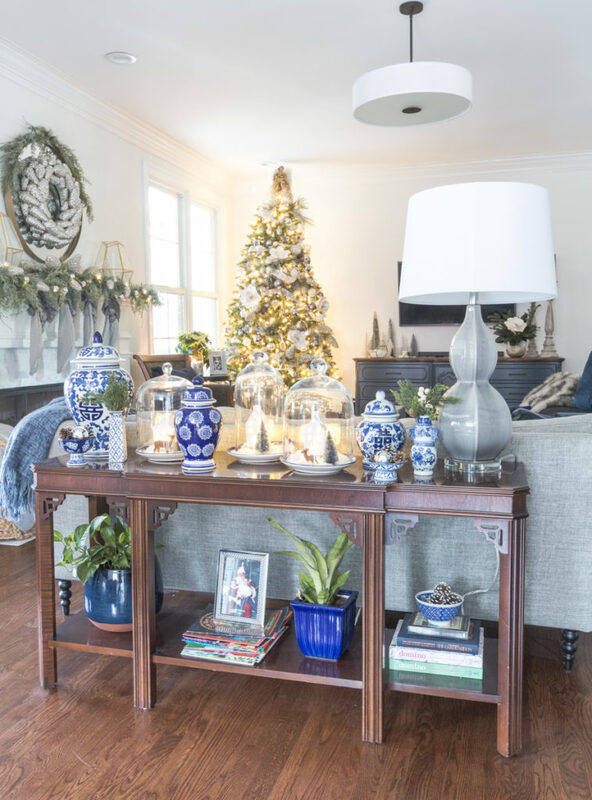 Such a beautiful Christmas home tour! I will hang it on my front door. 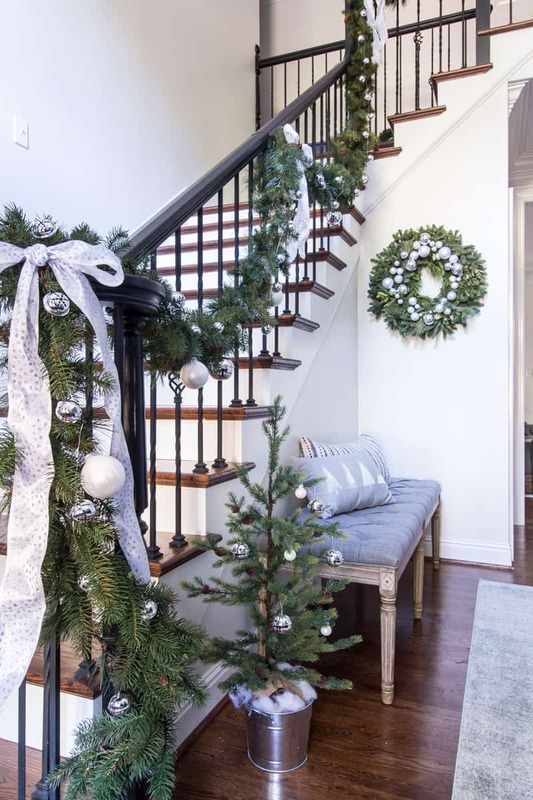 I would definitely have to hang that beautiful wreath on the door of my back porch so everyone could see it. It is gorgeous! I would hang this beauty on my front door. Thank you so much for the giveaway! 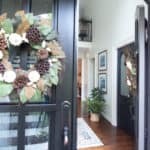 Your home looks so festive and ready for the holidays. Now you can relax and enjoy it all. I hope you have a very merry and happy holiday season. As always Leslie everything was beautifully done. 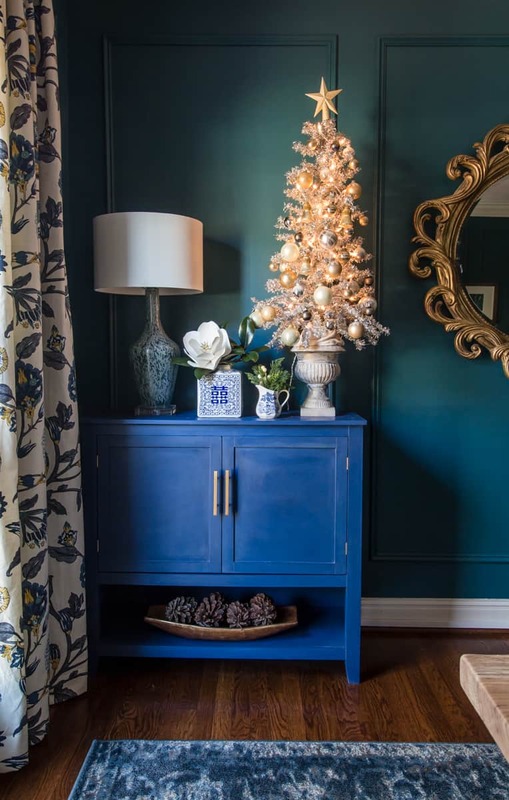 I love challenging myself too with decor from Xmas past to update and make it feel new. The tree looks beautiful as well. Enjoy it all. Everything is absolutely stunning from the front porch on! 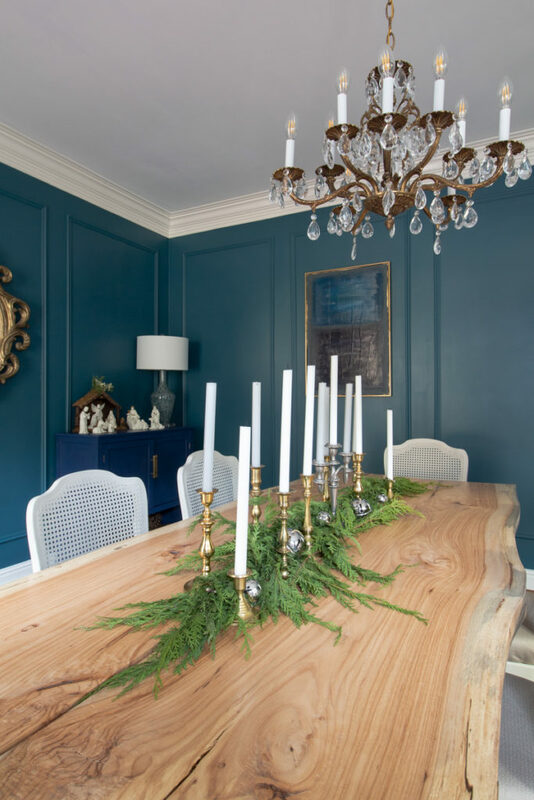 Love the magnolia touches that are carried throughout. Thank you for being a part of the tour Leslie. 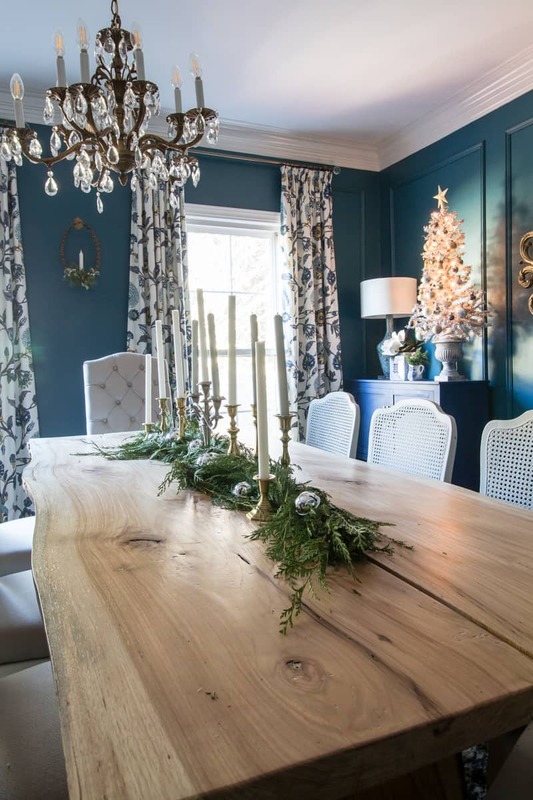 Leslie, your Christmas Home Tour is gorgeous! I can’t wait to see more! 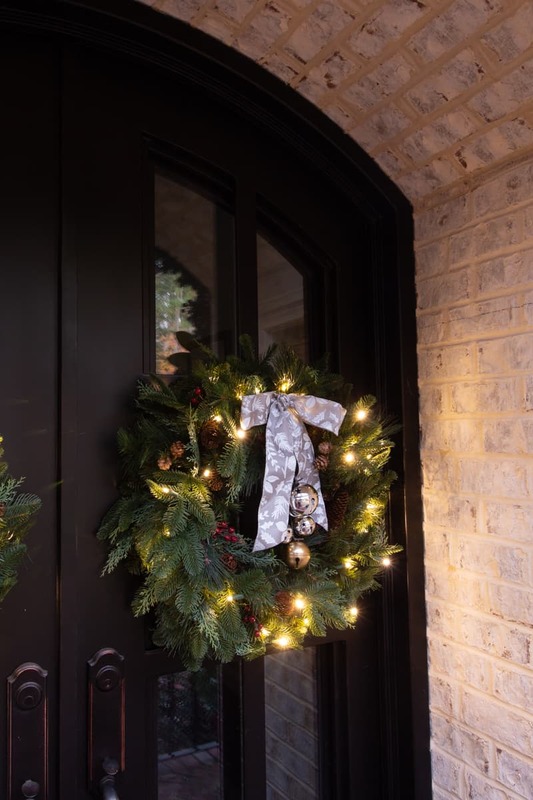 That Lynch Creek Farm wreath matches your Silver Bells & Magnolias theme so well! 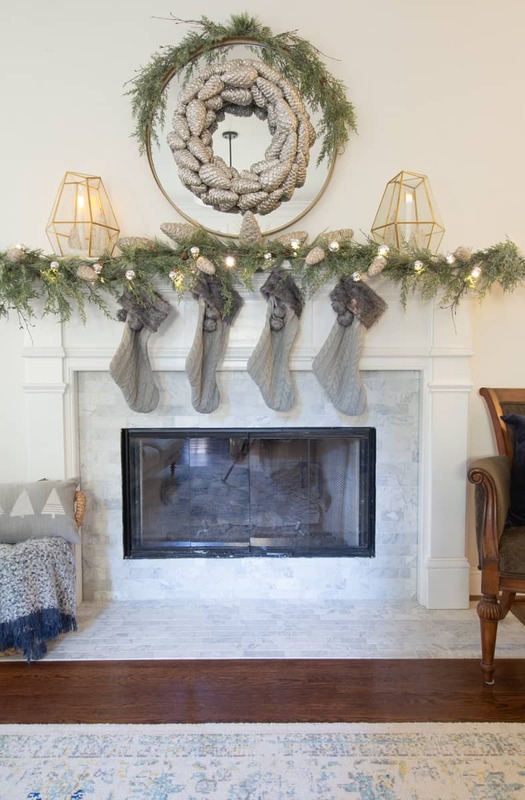 I would love to hang that stunning wreath above our mantle, it would look so lovely with our decor. 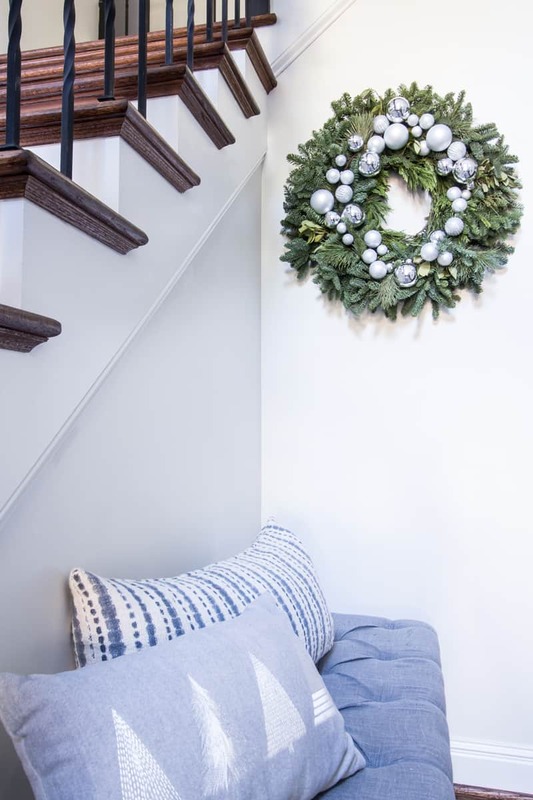 I would love to hang this wreath in my living room! Leslie you officially win the award for most beautifully decorated Christmas home. 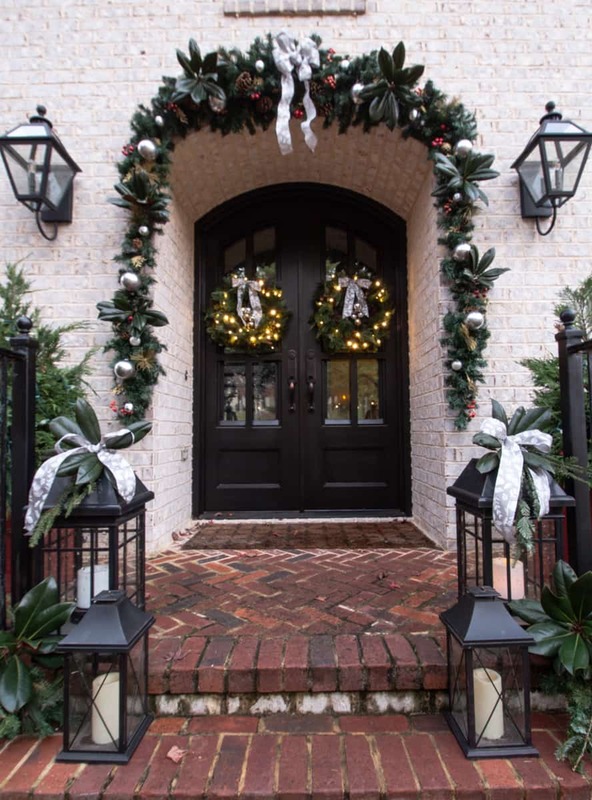 It is absolutely gorgeous, you know exactly how to make each space shine and that front door with all the brick gets me every time. So, so good.